Aktieselbskabet Den Norske Industri-og Vexelbank, Nominal 1.000...more Aktieselbskabet Den Norske Industri-og Vexelbank, Nominal 1.000 Kronen. 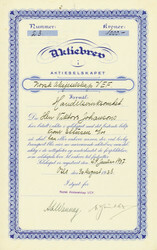 Christiania (Oslo), March 1898, Share of 1,000 Crowns, #4183, 38 x 24 cm, brown, blue, black, 4 pages, some coupons remaining, folds. The bank still exists today as Den Norske Bank. Today it is one of the most important Norwegian banks. 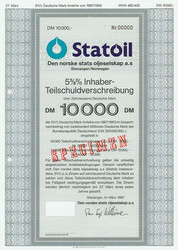 Statoil Den norske stats oljeselskap a. s., Nominal...more Statoil Den norske stats oljeselskap a. s., Nominal 10.000 DM. 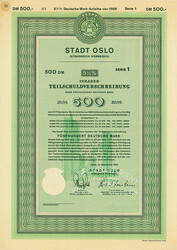 Stavanger, March 1987, Specimen of a 5.625 % bond for 10,000 DM, #00000, 29.7 x 21 cm, turquoise, blue, grey, red Specimen overprint, some coupons remaining. 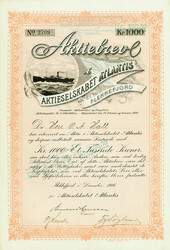 Aktieselskabet Atlantis, Nominal NA 1.000...more Aktieselskabet Atlantis, Nominal NA 1.000 Norwegische Kronen. Flekkefjord, December 1916, Registered share of 1,000 Norwegian Crowns, later stamped to 500 Norwegian Crowns, #2709, 33.2 x 22.6 cm, light brown, black, 4 pages, some coupons remaining, superb ship vignette. 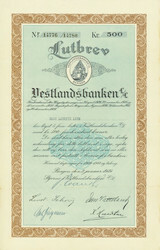 The Norwegian shipping company was incorporated on 17 January 1916. It transported goods by ship. Aktieselskabet Thorgny, Nominal NA 1.000 Kronen. Arendal, 25 April...more Aktieselskabet Thorgny, Nominal NA 1.000 Kronen. 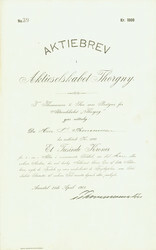 Arendal, 25 April 1908, Registered Share of 1,000 Crowns, #39, 37 x 23 cm, black, white, 4 pages, issued to Thor Thommesen (1873 - 1947), signed by Thommesen. Aksjeselskapet Kosmos, Nominal 14 x 25 NOK. 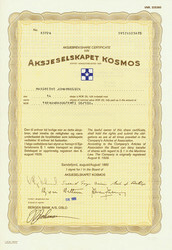 Sandefjord, August 1985,...more Aksjeselskapet Kosmos, Nominal 14 x 25 NOK. Sandefjord, August 1985, Share of 14 x 25 Norwegian Crowns, #83726, 30.5 x 20.8 cm, brown, blue, ochre, horizontal fold, text in English and Norwegian. The whaling company was founded in 1928 as Hvalfangstselskapet Kosmos A/S. It merged with the Hvalfangstselskapet Kosmos II A/S to form the A/S Kosmos in 1949. The company was taken over and split in 1988. Phönix Papirfabrik, Nominal 1.000 Kronen. 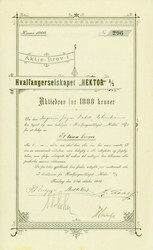 Drammen, 26 January 1916...more Phönix Papirfabrik, Nominal 1.000 Kronen. 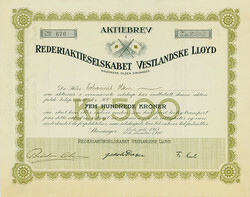 Drammen, 26 January 1916 (1915), Registered Shares of 1,000 Crowns, #323, 38.3 x 23.8 cm, brown, olive, black, 4 pages, some coupons remaining, edge uneven. Stadt Oslo, Nominal 500 DM. 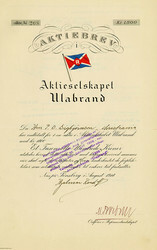 Oslo, December 1959, Specimen of a 5.5 %...more Stadt Oslo, Nominal 500 DM. Aktieselskapet "Hektor", Nominal 1.000 Kronen. 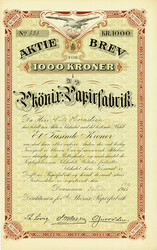 Tonsberg, August 1912,...more Aktieselskapet "Hektor", Nominal 1.000 Kronen. Tonsberg, August 1912, Aktie über 1.000 Kronen, #1232, strichentwertet, DB, zwei kleine Rostflecken, am unteren Rand etwas verschmutzt, sonst EF, links Abheftlochung, KR, Schiffsvignette. Viking Whaling Company Ltd., Nominal 10x£1. 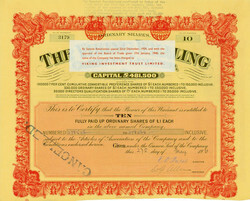 27.05.1931, Ordinary...more Viking Whaling Company Ltd., Nominal 10x£1. 27.05.1931, Ordinary Shares über 10 x £1, #3179, 28,7 x 36 cm, ocker, rot, schwarz, maschinenschriftlicher Hinweis auf die 1938 erfolgte Neuordnung des Grundkapitals, Aufkleber über die 1940 erfolgte Umbenennung in Viking Investment Trust Limited, KR, Eckbereiche mit leichten Knicken, sonst EF, OU Erling Dekke Naess. Erling Dekke Naess, brother of the well known philosopher Arne Dekke Naess, was a Norwegian businessman and shipowner. Due to lack of money he was first working as a banker like his father Ragnar Naess did before. During his economy studies in the evenings he was more and more influenced by John Maynard Keynes. Further on the young Naess was really impressed by the imbalances created by the German war reparations: Watching the currency market he took notice of the inflationary and disastrous decline of the German mark. After his studies were finished Naess wanted to use his market research and started with small, but nevertheless successful investments in rubber and tin. In 1927 he was contacted by Rupert Trouton, who convinced him to buy control of the Norwegian company A/S Hektor – a whaling enterprise of Trouton’s father-in-law. 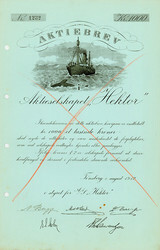 Establishing the Hektor Whaling Ltd Naess made a huge profit. In 1928 the Norwegian whaling pioneers Torger Moe and Johan Rasmussen planned to build one of the world's first whale factory ship. Naess arranged financing of their Viking Whaling Company Ltd – and after its first season the vessel Vikingen was once more a success! More than that the company bought shares of other Norwegian companies like A/S Vestfold, A/S Sydhavet and A/S Rosshavet. But, within the depression the prices collapsed and at the beginning of the 1930s the company was close to bankruptcy. Only due to Naess's good connections in London the Norwegian company was saved. The companies’ business continued for some further years, in 1940 the name was finally changed to Viking Investment Trust Limited. Røldal-Suldal Kraft A/S, Nominal US-$ 1.000. 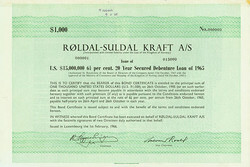 Luxembourg, 1 February...more Røldal-Suldal Kraft A/S, Nominal US-$ 1.000. Hvalfangerselskapet "Hektor" A/S, Nominal Aktie-Brev. Tønsberg, 24...more Hvalfangerselskapet "Hektor" A/S, Nominal Aktie-Brev. Tønsberg, 24 October 1910, Registered Share of 1,000 Crowns, #296, 35 x 21.4 cm, black, white, DB, KR, folds, OU. 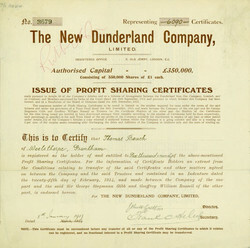 New Dunderland Company, Limited, Nominal 6.090 Profit Sharing...more New Dunderland Company, Limited, Nominal 6.090 Profit Sharing Certificates. 8 January 1917, 6.090 Profit Sharing Certificates, # 3679, 25.2 x 25.2 cm, brown, beige, folds, the certificate represented 1.74 % of all Profit Sharing Certificates. Thomas Alva Edison gründete am 22.06.1898 in London die Edison Ore-Mailling Syndicate Limited. Damit wollte er seine Bergbaupatente außerhalb der USA und Kanadas nutzen. Am 22.04.1902 gründete Edison dann die Dunderland Iron Ore Co. Limited. Diese hielt die Aktienmehrheit an der Edison Ore-Mailling Syndicate Limited. Beide Gesellschaften legten den Grundstein für den Eisenerzabbau in Dunderland und dem Gebiet von Rana. Sie legten damit den Grundstein für das heute größte Industriegebiet in Norwegen. Am 26.09.1913 wurde die Gesellschaft als New Dunderland Iron Ore Company reorganisiert. Die Profit Sharing Certificates der New Dunderland Company Limited wurden im Zusammenhang mit der Reorganisation derr New Dunderland Iron Ore Company ausgegeben. Die norwegischen Bergbauanlagen wurde 1947 von der AS Norsk Bergverk übernommen. Zehn Jahre später gingen sie in der AS Rana Gruber über. Rederiaktieselskabet Vestlandske Lloyd, Nominal NA...more Rederiaktieselskabet Vestlandske Lloyd, Nominal NA 500 Kronen. 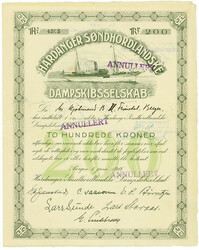 Stavanger, 15 July 1915 / 31 December 1916, Registered Share of 500 Crowns, #670, 23.8 x 30.3 cm, olive, black, some coupons remaining, folds, vignette with two flags, inside transfers. Vestlandsbanken L/L, Nominal 5x100 Kronen. Bergen, 02.01.1939,...more Vestlandsbanken L/L, Nominal 5x100 Kronen. Bergen, 02.01.1939, Lutbrev über 5x100 Kronen, #14776-80, 35 x 22,5 cm, türkis, braun, schwarz, DB, Knickfalten, OU. Gronlands Hvidfiske-Actieselskab, Nominal 1 Aktie. Christiania...more Gronlands Hvidfiske-Actieselskab, Nominal 1 Aktie. 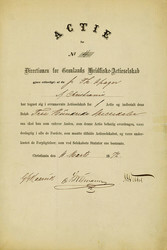 Christiania (Oslo), 11 March 1872, one Share, #4, 34.7 x 23.3 cm, black, white, 4 pages, statutes inside, folds, tears repaired with tape, R12! Norsk Aksjeselskap VEF, Nominal 1.000 Kronen. 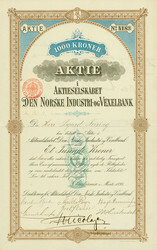 Oslo, 30.08.1938,...more Norsk Aksjeselskap VEF, Nominal 1.000 Kronen. Oslo, 30.08.1938, Namensaktie über 1.000 Kronen, #23, 36 x 22,6 cm, blau, schwarz, DB, Knickfalten, OU. At Fridtjof Nansens plass 6 in Oslo the company operated as an agency for radios and electronics. Aktieselskapet Ulabrand, Nominal 1.800 Kronen. Tönsberg, August...more Aktieselskapet Ulabrand, Nominal 1.800 Kronen. Tönsberg, August 1918, Share of 1,800 Kronen, #208, 4 pages, stamp, horizontal fold, partially light creases. The shipyard belonged to the Holding company of Hjalmar Roed. It owned the steamer Ulabrand which was destroyed by a German submarine in 1918. Hardanger Söndhordlandske Dampskibsselskab, Nominal NA...more Hardanger Söndhordlandske Dampskibsselskab, Nominal NA 200 Kronen. Bergen, 1 June 1918, Registered Share of 200 Crowns, #4305, 28.6 x 22.7 cm, green, beige, horizontal fold with 1 cm tear, dog ear, stamp cancelled, superb ship vignette.